Change of plans……you never know what will happen next when you are on a boat. We left Gorge Harbor on our way to Surge Narrows and the Octopus Islands timing everything to arrive at the rapids at slack tide. 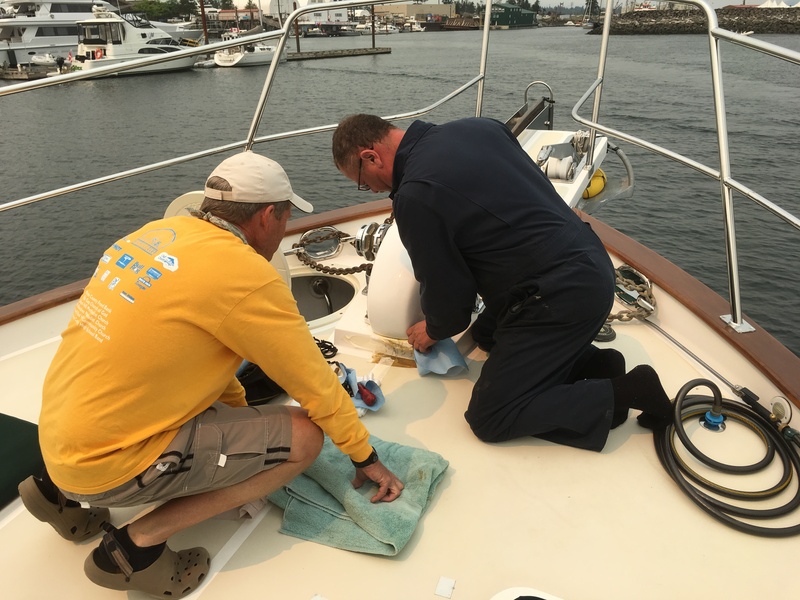 A glance at our windlass, which worked perfectly earlier this morning, and we saw oil dripping onto the bow of the boat. We knew immediately that this was a game changer. Our windless is a critical piece of equipment especially the farther north we get. Without the ability to anchor, we are not going anywhere. Luckily, Campbell River is only 25 miles away. However, this is a three day holiday weekend in Canada and the marina is full. After explaining our situation, they find room for us. More calls back to Philbrooks and we have parts being overnighted to us. We are pretty sure it will be a simple fix of seals being replaced. Jeff replaced these seals three years ago. A mechanic is scheduled for the next day. Long story short, the parts get held up at Customs due to the shipper filling out the wrong paperwork. With the holiday weekend, this means the parts won’t arrive for another four days. It’s a boat! 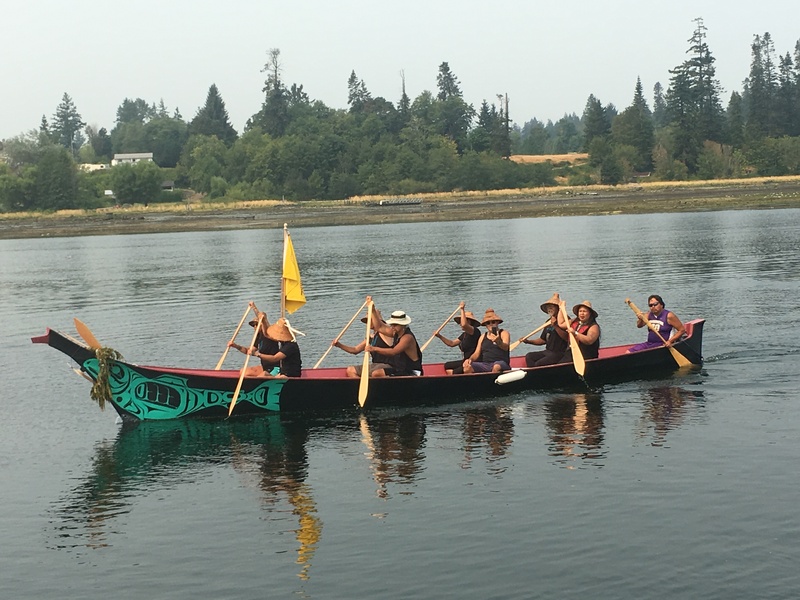 Campbell River is home to the Wee Wai Kai First Nation Band. It fact our marina is owned and run by this Band. They also own much of the land around here currently occupied by Walmart, Canadian Tire, and several grocery stores. 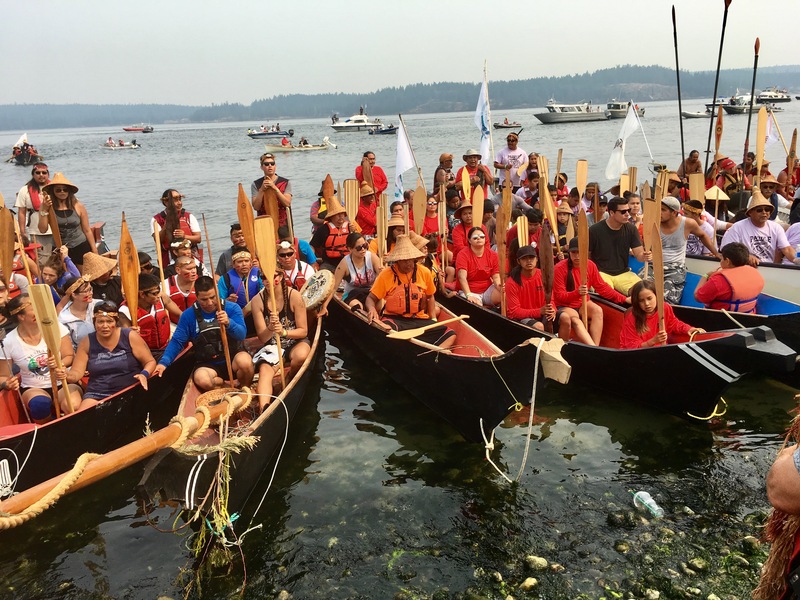 The big event of the weekend is the annual Tribal Journey being held this year in Campbell River. Hand carved longboats are paddled by many different visiting bands. Over fifty boats arrive on Saturday from both the north and south, California to Alaska. We head out to the Campbell River spit and watch these boats arrive. The local Wee Wai Kai Chief greats each boat as it arrives on the shore. Thousands of people gather to witness this event. 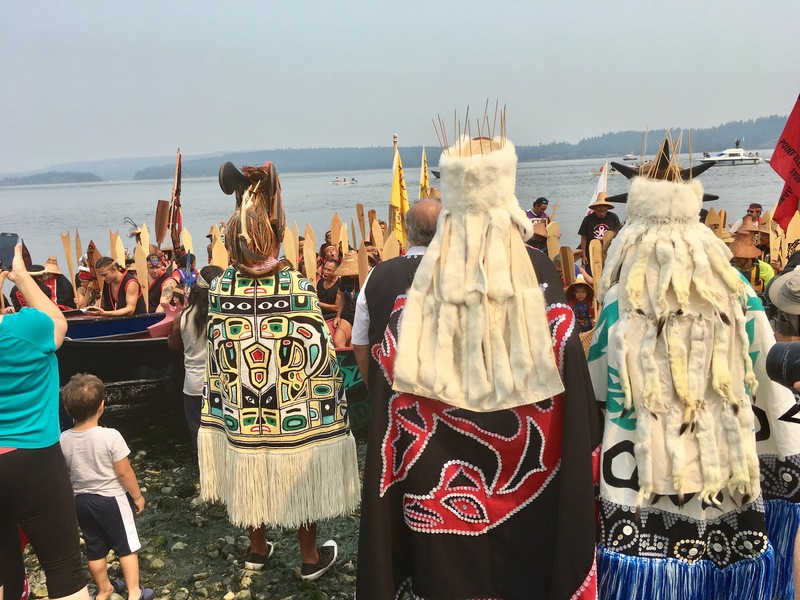 The gathering continues all week long at the First Nation’s Long House. Each band speaks about their heritage and current situation along with descriptive dances by the various bands. It is fascinating to get a glimpse of their culture. 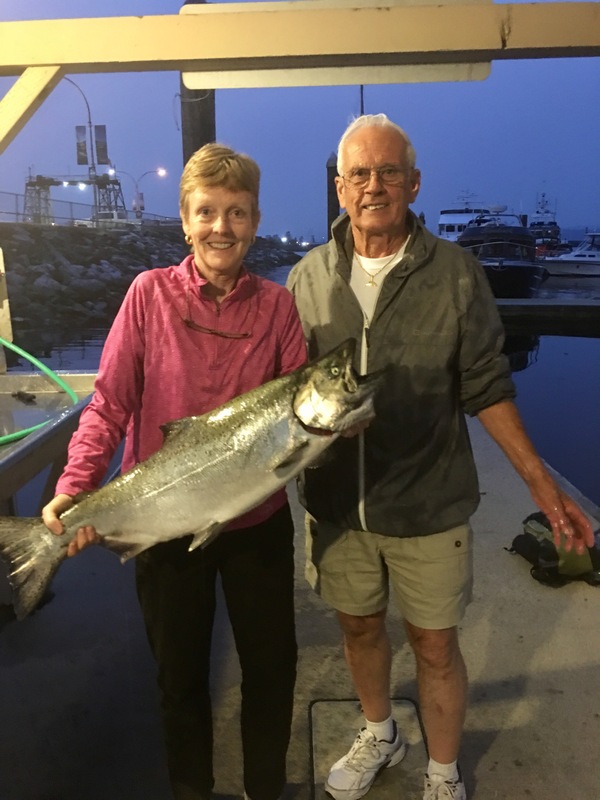 Campbell River is a salmon fishing mecca. There are over 600 charter fishing guides in the area. 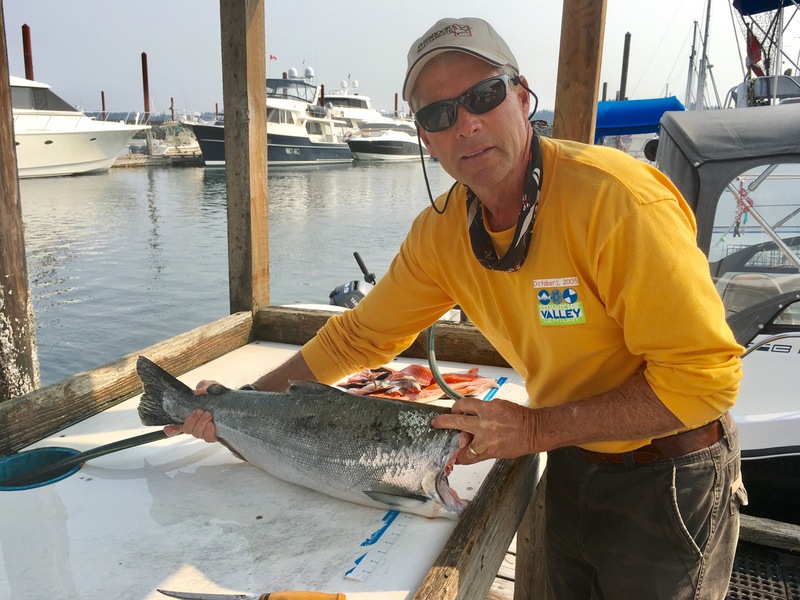 Talking with the captain of a large yacht at our marina, Bob Nuttall’s Salmon Charters is highly recommended. We have fished a lot on the east coast but have no skills or techniques of PNW fishing. 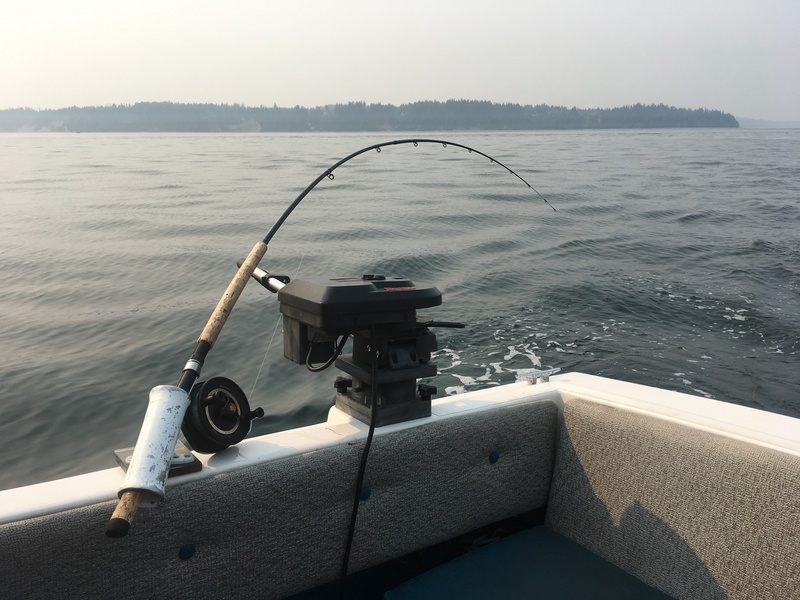 They use totally different gear and bait to catch salmon. Here they use down-riggers and fish up to 200 feet deep for the fish. Sunday afternoon Bob picks us up for a late day fishing charter. Bob gladly shares his knowledge of gear, lures, and fishing techniques that are used in the Campbell River area. 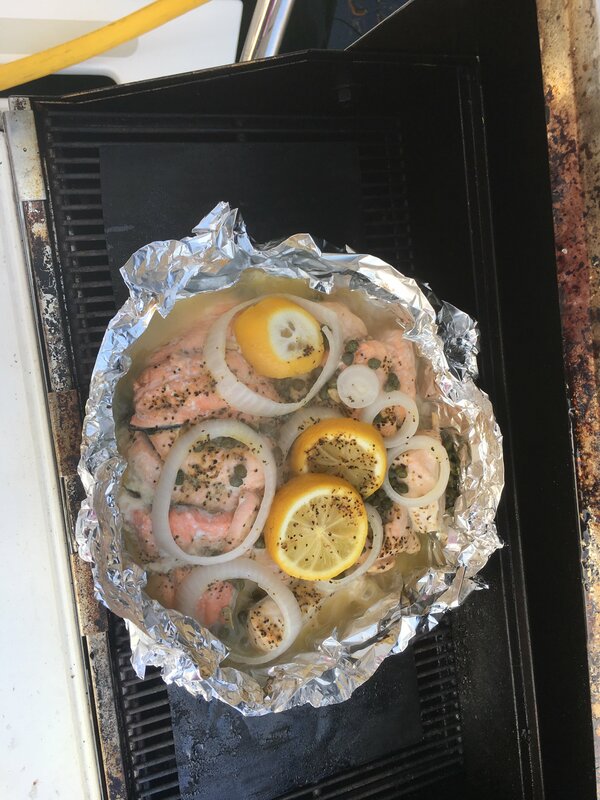 The five species of Pacific salmon are Chinook, Chum, Coho, Pink, and Sockeye. The Chinook, also called Spring and King Salmon, are the largest. If you catch one over 30 lbs. it is called a “Tyee”. Although we didn’t catch a “Tyee”, we did really well. By the end of the day, we had three Chinook, the largest being 20 lbs. and one hatchery Coho. We caught another three Coho but they had to be released. We learned that only the hatchery Coho can be kept. You can easily identify these fish as they are missing their back fin where the wild Coho have this fin. 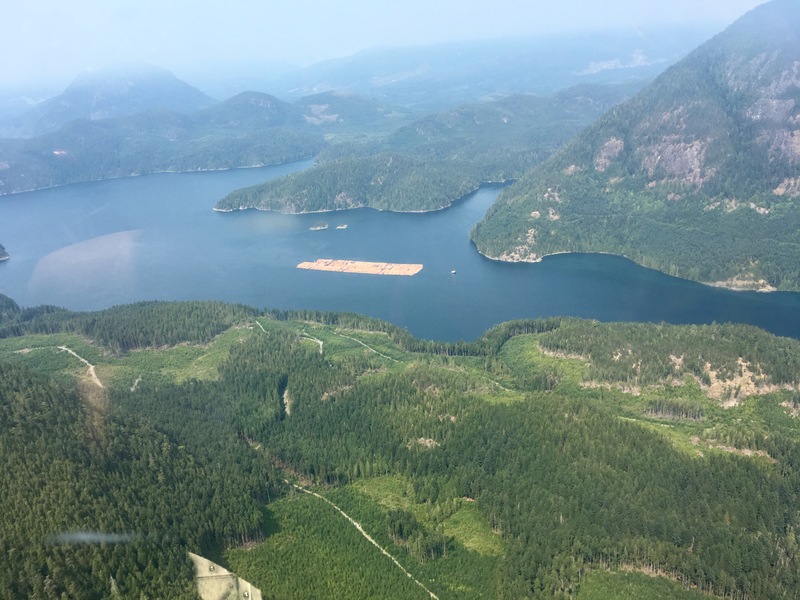 Last year alone, the Canadian government released over a million Coho into the Campbell River area. Good news is our freezer is now full of fish. The bad news is we now know that we need all new fishing gear. 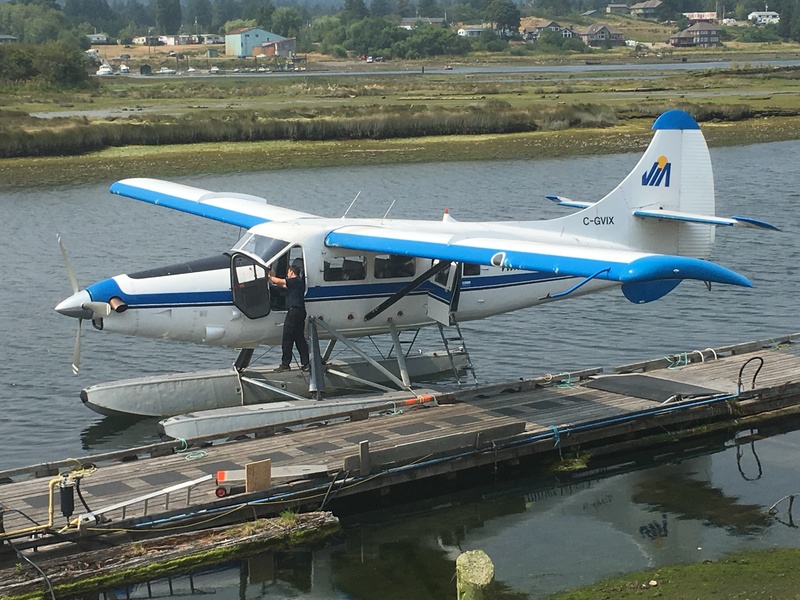 Ever since arriving to the PNW, Jeff has been drooling over the many float planes ( yes, he wants one badly but Susie says no way). 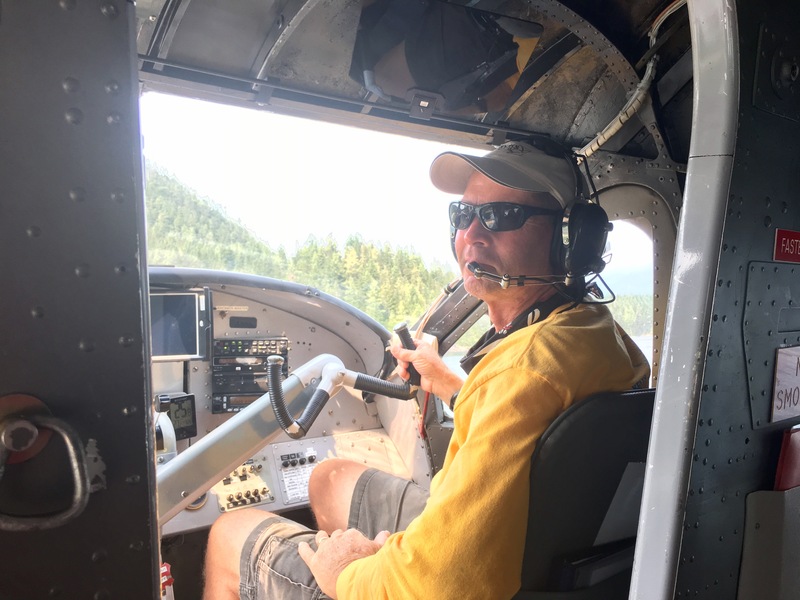 Stopping in at Vancouver Island Air, we learned that you can fly along on one of their mail runs to some of the islands north of here. This was an easy decision and soon we were booked on their Monday flight. Our three hour flight, on the jet turbine Otter made in 1953, took us north into the Broughtons. We made three stops, the first to Blind Channel Resort dropping off some guests. Our next two stops were to some of the native First Nation villages. It was fascinating seeing these remote waters from the air. These are all areas we will be cruising in the next few weeks. Seeing these areas from the air makes us realize just how remote we will be once we are north of here. Back aboard Idyll Time, our parts finally arrived and Ralph from Altech Diesel will hopefully be here tomorrow morning to reinstall the windlass. We will be leaving the docks shortly after hoping to catch slack tide at Surge Narrows tomorrow evening at 7 pm. See you on the other side of the rapids. This entry was posted on August 9, 2017 at 4:02 am. You can follow any responses to this entry through the RSS 2.0 feed. You can leave a response, or trackback from your own site. 3 Responses to "Campbell River"
I came across your site via the Krogen links because it’s something we would like to do, sooner rather than later. Just wanted to say, LOL on the photo of the Nanaimo bars! I make these as special holiday gifts to friends here in Virginia (as a result of discovering them in the NW when we lived there). Makes us look like we’re awesome — if they only knew even everyday ferry riders know this delicious treat. Thank you for your really excellent site — just when I’m wondering something as I read, you write the answer!! Best wishes for safe and exciting travels in what I think to be one of the most beautiful places on earth! HI Susie and Jeff, we’re very much enjoying your blog – your prose and photos put us right smack in the middle of your adventures. Excellent! You’re right that “it’s a boat” with your heater and windlass problems. We have been without refrigeration for a month now, constantly living with ice blocks in the fridge, and parceling out our stored food to neighbors who have room in their fridges. All kinds of issues with getting the fridge replaced (yes, it’s totally dead), not just mechanical but health/family stuff. Hopefully next week we’ll have the new system. By the way, those question marks went in as emojis of a smile and a sailboat. I guess this system doesn’t support that.